Lehigh Valley United is proud to announce that two of our talented Alumni have been recognized with great honors for their scholastic soccer achievements this year. 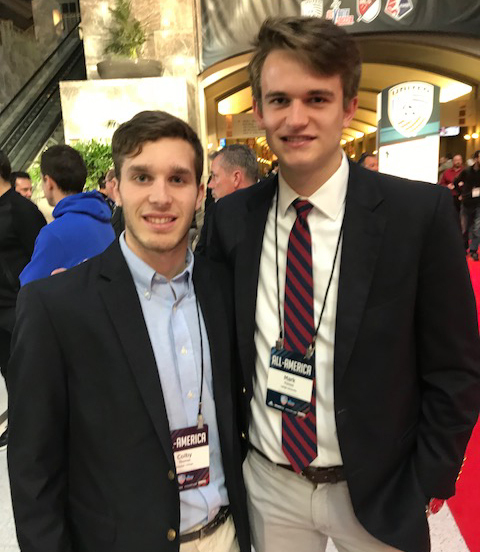 Both Mark Forrest (LVU '96) and Colby Thomas (LVU '95) were recognized as “All Americans” at the United Soccer Coaches Association Convention All American Luncheon in Philadelphia, PA. LVU is extremely proud of the accomplishments of these and of all our players, and look forward to Mark and Colby's continued success both on and off the field. Mark is a junior at Lehigh University and was honored with United Soccer Coaches NCAA Div 1 All – American 3rd Team Selection. Mark came 2nd in the Nation with 38 points and 4th in the Nation with 15 goals in NCAA Division 1. Additional honors that Mark won in the season include All – ECAC 1st Team Selection, All NCAA North-East Region 1st Team, Patriot League Offensive Player of the Year, Patriot League 1st Team Selection, 3-Time Patriot League Offensive Player of the Week, All-Patriot League Pre-Season 1st Team and Lehigh University Athlete of the Year (Soccer). Mark’s Lehigh University coaches Dean Koski, Ryan Hess, Matt Deming and Brendan McIntyre are all members of the LVU coaching staff. Mark joined LVU when he was 11 and has played for the club every year since. He is currently a member of the LVU PDL team. Colby is a Senior education major at Messiah College, pursuing dual certification in elementary education and special education. He was honored with United Soccer Coaches NCAA Div 3 All – American 3rd Team Selection. Colby’s 9 goals and 12 assists helped Messiah to their 11th D lll National Championship in 2017. He lead the team with 12 assists, as well as 7 game winning goals. His 3.6 GPA earned him academic honors during the season. Additional honors that Colby received in the season were All MAC, and All Region. In Colby’s career at LVU he competed in 4 USYSA National Tournament berths and was a 2012 National Finalists. ©2019 Lehigh Valley United. All rights reserved.